The general dentist is usually the first health care practitioner to evaluate oral disease, initiate treatment and manage complications. Although rare, devastating outcomes of dental surgery can include Ludwig angina, mediastinitis, hemorrhage, necrotizing fasciitis, Lemierre syndrome and osteomyelitis. Osteomyelitis is a well known, but rare complication of dental extractions that can mimic multiple benign and malignant processes. 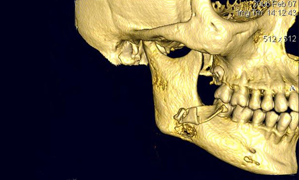 In this case report, we review the diagnosis and management of an advanced postoperative mandibular osteomyelitis that developed following the removal of a mandibular third molar. Dentists are familiar with several rare complications of third molar surgery including Ludwig angina, mediastinitis, hemorrhage, necrotizing fasciitis and Lemierre syndrome.1-4 In this case report, we review the diagnosis and management of an advanced mandibular osteomyelitis that developed following the removal of a mandibular third molar tooth and focus on its nonspecific symptomatology. A healthy 29-year-old woman's tooth 48 was extracted by her general dentist, following management of pericoronitis. A week later, a sudden exuberant hemorrhage occurred at the surgical site and was promptly controlled using direct pressure. From this point, the patient began to complain of diffuse pain and mild swelling along the right posterior mandible. Although the swelling was intermittent, the pain was constant but adequately controlled with oral ketorolac. The patient described the pain as sharp and extending from the ipsilateral ear to the chin and, inferiorly, to the lower border of the mandible. The dentist made an initial diagnosis of myofascial pain and right temporomandibular joint (TMJ) capsulitis. Approximately 3 months after the extraction, the patient was referred to an oral and maxillofacial surgeon with continued pain and swelling. Based on the history and radiographic and clinical examination, which revealed an osteolytic mandibular lesion with swelling in the buccal vestibule adjacent to the site of tooth 48 as well as in the right submandibular region, the diagnosis was changed to chronic suppurative osteomyelitis. The patient was prescribed a 1-month course of oral penicillin and metronidazole. Although the pain diminished considerably, right submandibular and submasseteric swelling and tenderness was still apparent. The patient was prescribed an additional 1-month course of oral clindamycin. Six months following the initial procedure, the patient was referred for further advanced imaging to evaluate a dense medullary pattern of bone in the right mandible visualized on an orthopantomogram (Fig. 1). The patient's computed tomography (CT) and nuclear scans were indeed indicative of diffuse osteomyelitis involving the right body of the mandible (Fig. 2). No sequestrae were visible radiographically. At this time, the patient's maximum interincisal opening was reduced to 20 mm. All blood tests were unremarkable, including a differential white blood cell count. Figure 1: Orthopantomogram with osteomyelitic process associated with the right mandibular body, ramus and condyle. Figure 2: Computed tomography coronal view (a), technetium 99 bone scan (b) and 3-dimensional reconstruction (c) illustrating the osteomyelitic process associated with the right mandible. Moxifloxacin was added to the antibiotic regimen because of the lack of resolution of this chronic suppurative osteomyelitis, and arrangements were made for 20 sessions of hyperbaric oxygen therapy (HBOT). The latter began 11 months after extraction of tooth 48. Only temporary benefit was realized following HBOT, and, in the ensuing months, the patient continued to suffer from transient discomfort, trismus and swelling associated with the right mandibular region. As the symptoms progressed, the patient was admitted to hospital on several occasions for intravenous antibiotics and localized debridement under general anesthesia. Unfortunately, her clinical condition continued to deteriorate, and, 18 months following the extraction, she was re-admitted to hospital, febrile with severe pain and associated right masticatory and buccal space infections. Repeat imaging demonstrated that the osteomyelitic process had encompassed the bulk of the ramus and the body of the mandible just mesial to tooth 46. After a detailed discussion with the patient, a decision was made to proceed with resection of the affected portion of the mandible. The surgical procedure consisted of resection of sclerotic bone including the condyle, ramus and a portion of the body of the right mandible. Teeth 45, 46 and 47 were included in the resection, which extended until bleeding marrow, representative of healthy bone, was identified. Interim reconstruction consisted of a weight-bearing reconstruction plate to which a prosthetic condylar head was secured (Fig. 3). The patient did very well postoperatively, showing immediate improvement in all infection-related symptoms (Fig. 4). Following the resection, she was maintained on antibiotics for an additional 3 months, by which time all symptoms of osteomyelitis had resolved. Figure 3: Orthopantomogram of resected right mandible and load-bearing reconstruction plate and prosthetic condylar head. Figure 4: Postoperative photographs showing adequate esthetic outcome in frontal (a) and profile (b) views. Worm's eye view (c) illustrates the prominent mandibular angle associated with the interim reconstruction with a load-bearing plate. A year and a half after the mandibular resection, the patient's right mandibular defect was reconstructed using an allogeneic demineralized and lyophilized mandible as a carrier for autogenous bone harvested from the posterior iliac crest (Fig. 5). The allogeneic mandible was hollowed and filled with autogenous particulate bone. Six months following the reconstruction, the bone graft showed clinical and radiographic signs of consolidation, and the patient remained free of any signs or symptoms of osteomyelitis (Fig. 6). The final occlusion was acceptable and implant rehabilitation of the patient's missing dentition is planned for the near future (Fig. 7). Figure 5: Definitive mandibular reconstruction using an allogeneic demineralized and lyophilized cadaveric mandibular crib (a) and autogenous particulate cancellous bone graft (b). Figure 6: Orthopantomogram of reconstructed mandible with cadaveric mandibular crib and autogenous particulate cancellous bone graft. Figure 7: The preoperative Class I malocclusion and midline relationship was re-established (a). The posterior right mandible included adequate bone and soft tissue for future implant rehabilitation (b). The general dentist is usually the first health care practitioner to evaluate oral disease, especially when it relates to the tooth-bearing region. Osteomyelitis is a relatively rare complication of dental extractions that can mimic multiple benign and malignant processes. To triage and treat these patients successfully, the dentist must have a working understanding of the signs and symptoms associated with osteomyelitis. Osteomyelitis is an infectious inflammatory disease of bone caused by bacterial colonization of the bone marrow. The pathophysiology involves the accumulation of an inflammatory exudate in the bony medullary cavity and beneath the periosteum, causing compression of the central (sinusoidal) and peripheral blood supply to the bone. Ultimately, the osseous blood supply becomes compromised, reducing the supply of nutrients and oxygen. The remodeling of bone necessary for regeneration is also compromised. Necrotic tissue promotes the proliferation of bacteria, which, without appropriate intervention, will result in incomplete healing and progression of the osteomyelitis. Osteomyelitis occurs in 2 phases: an early or acute phase, which is usually suppurative, and the later chronic phase, which may or may not be suppurative. Chronic disease is deemed to be of greater than 1-month duration and may represent either a lack of response to initial therapy or an overpowering of the host defenses. Osteomyelitis of long bones has been associated with the iatrogenic introduction of Staphylococcus aureus and S. epidermis during surgery or trauma. Hematogenous spread of bacteria to bone is also well documented.5 Conversely, osteomyelitis in the tooth-bearing region is usually polymicrobial. The plethora of oral microbial flora and the inherent opportunity for breaching the mucosal barrier, provide a favourable environment for pathogens, such as streptococci and other opportunists, to invade bone. As the infectious process matures and isolates itself from the body's host defense mechanisms, Actinomyces and Eikenella become more prevalent in refractory forms of osteomyelitis of the jaws.6 These organisms may dominate after suboptimal therapeutics fail to eradicate potential pathogens during initial attempts. The case described above demonstrates the typical features of chronic suppurative osteomyelitis. In the management of this patient, antibiotics and nonsurgical measures were used without success. Broad-spectrum antibiotics were instituted to combat Actinomyces and Eikenella. Adjunctive HBOT provided temporary pain relief. Initial surgical treatment consisted of sequestrectomy and decortication in conjunction with intravenous antimicrobial therapy with limited success. This procedure is consistent with protocols published by others.10-12 When less invasive procedures fail, partial resection with staged reconstruction has been reported to be successful in the treatment of refractory osteomyelitis,13 as illustrated in this case. Sandor GK, Low DE, Judd PL, Davidson RJ. Antimicrobial treatment options in the management of odontogenic infections. J Can Dent Assoc. 1998;64(7):508-14. Moghadam HG, Caminiti MF. Life-threatening hemorrhage after extraction of third molars: case report and management protocol. J Can Dent Assoc. 2002;68(11):670-4. Fenton CF, Kertesz T, Baker G, Sándor GK. Necrotizing fasciitis of the face: a rare but dangerous complication of dental infection. J Can Dent Assoc. 2004;70(9):611-5. Albilia JB, Humber CC, Clokie CM, Sándor GK. Lemierre syndrome from an odontogenic source: a review for dentists. J Can Dent Assoc. 2010;76:a47. Mader JT, Shirtliff ME, Bergquist SC, Calhoun J. Antimicrobial treatment of chronic osteomyelitis. Clin Orthop Relat Res. 1999;(360):47-65. Marx RE, Carlson ER, Smith BR, Toraya N. Isolation of Actinomyces species and Eikenella corrodens from patients with chronic diffuse sclerosing osteomyelitis. J Oral Maxillofac Surg. 1994;52(1):26-33; discussion 33-4. Triplett RG, Branham GB, Gillmore JD, Lorber M. Experimental mandibular osteomyelitis: therapeutic trials with hyperbaric oxygen. J Oral Maxillofac Surg. 1982;40(10):640-6. Gill AL, Bell CN. Hyperbaric oxygen: its uses, mechanisms of action and outcomes. QJM. 2004;97(7):385-95. Hohn DC. Oxygen and leukocyte microbial killing. In: Davis JC, Hunt, TK, editors. Hyperbaric oxygen therapy. Bethesda, Md. : Undersea Medical Society Inc.; 1977. p. 101-10.
van Merkesteyn JP, Groot RH, van den Akker HP, Bakker DJ, Borgmeijer-Hoelen AM. Treatment of chronic suppurative osteomyelitis of the mandible. Int J Oral Maxillofac Surg. 1997;26(6):450-4. Kim SG, Jang HS. Treatment of chronic osteomyelitis in Korea. Oral Surg Oral Med Oral Pathol Oral Radiol Endod. 2001;92(4):394-8. Koorbusch GF, Fotos P, Goll KT. Retrospective assessment of osteomyelitis. Etiology, demographics, risk factors, and management in 35 cases. Oral Surg Oral Med Oral Pathol. 1992;74(2):149-54. Suei Y, Tanimoto K, Miyauchi M, Ishikawa T. Partial resection of the mandible for the treatment of diffuse sclerosing osteomyelitis: report of four cases. J Oral Maxillofac Surg. 1997;55(4):410-4; discussion 414-5.